Things That Go Grump in the Night! Of course! Why didn’t I figure this out long ago? I know how to keep marriages together. Just not my own. A Brand New Study shows that people’s sleep styles (and positions) says something significant about their relationship – – And could possibly be a predictor of long term marital success. It particularly talks about the proximity of sleeping close with your partner. A full 94 percent of couples who make physical contact with each other while sleeping, enthusiastically state they are happy in their relationships. However, there are no statistics that apply to marriages like mine — marriages where one (insomniac) mate makes plenty of physical contact with the other (sleeping) mate. Using her fists. And hisses one of the following phrases (or all four at once) a) Move over! b) Stop snoring! c) Give me some covers! d) You’re mumbling unintelligibly in your sleep again. . . something about Suzanne Somers, your golf game and our mortgage payment. The Couple that Sleeps Together, Keeps Together?? And guess what? Only a mere 2 percent of couples sleep more than 30 inches apart. How do the rest of you 98 percent touchy/feely types stand it? With a Human Noisemaker slumbering on a neighboring pillow, sounding off every night at midnight. I always felt I should put on a pointy party hat and sing, “Should old acquaintance be forgot….” in between all the snoring, whistling, teeth-grinding, coughing, sputtering, fluttering and muttering. And that was just the auditory portion of the nightly Surround-Sound show. There was a Tactile element too. It featured such sensations as: a) hot breath on my neck b) seismic mattress movements, (that made me check our earthquake supply kit the next morning) and c) getting squeezed in weird, sporadic, jerky involuntary muscle releasing rhythms as he drifted off peacefully, holding my waist hostage. Am I the only one who believes sleeping should be a solo (Olympic) event? You need the entire bed (court) all to yourself to perform the best stunts. “The Sideways Sleep Sheet Struggle” requires single status. “The Triple Pillow Flip with a Half Twist” is also best implemented alone, with a pillow slip that’s labeled, “The Cooler Side,” of course. Even the traditional “Check the Clock Every Hour to Figure Out How Much Shut Eye You Can Get Before Your Alarm Goes Off” maneuver is not a team event – – if you want to have perfect (panicky) form. Sleep close together . . . and you too, can be this deliriously happy! Miss Menopause’s Screening Test: Is the Innocent, Exhausted Woman Possibly the Problem In Bed – – or is that Thoughtless, Annoying Male the True Likely Culprit? 2. I would never throw an attractive partner out of bed for eating crackers. But Knuckle Crackers, Jaw Slackers, Pillow Stackers, & Head Smackers (no matter how studly) are another story. 3. My favorite invention would be a linking device attached to the television remote control. Every time “he” changes the channel during Desperate Housewives, the thermostat adjusts up (for my thyroid trouble) or down (for my hot-flashes) by five degrees. The Couple That Sleeps Together, Weeps Together?? 4. Anything he mutters incoherently, (after I insist he roll over) is grounds for next day interrogation. I also think it’s fair (after being kept up all night) to claim that while talking in his sleep, he graciously promised to mow the lawn this weekend before taking me out to dinner. 5. If he is loud enough to be mistaken for a New Year’s Eve noisemaker, it might be interesting to find out what kind of 4th of July firecracker he would make. Putting a teaspoon of PopRocks in his mouth while he snoozes, is the next logical step to that end. 6. Sometimes when my mate is zzzzzz-ing away, I get so bored that I drag the dresser bureau, the nightstands, and the bed (with him in it) around in different positions. I then frantically pull his arm until he awakens, announcing that an Interior Decorator just broke into the house to rearrange the furniture. And now we need new drapes. 7. My spouse has two of the most unusually annoying habits. Inhaling and exhaling. Look at this photo. 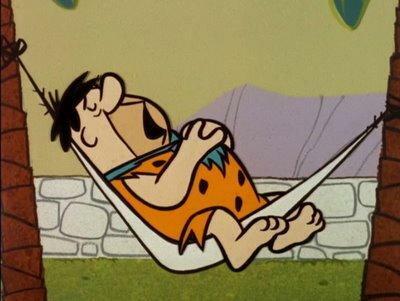 Who is to blame for Hammock Hell – – Wilma or Fred? 8. I often politely tell my mate to scooch over just a bit. Then a tad further. A trifle more. And just another smidgeon, yet again. One last inch, please. Whoops. Sorry down there! 9. “Watching the contours of my husband’s handsome face while he sleeps is my favorite pastime,” said no Wife ever. 10. After viewing this scene from a famous show (click here) I feel like he probably had it coming. I also think twin beds are a wonderful invention. But twin beds in Twin Cities would be even better! Ear plugs, shin guards, and shoulder pads work for me! Ah- there’s the strikeover we were talking about! You can’t see it right now ( my coworkers can), but I’m giving you a standing ovation for this entertaining and very informative piece. In fact, this is proof that you’re a highly qualified love doctor. If you’re not charging for your services, you should start! I must tell you that “insidiously tightly coiling his/her body around you like a Python snake” is most definitely the most accurate and creative description of the situation I find myself in most often! I’m grateful my husband likes me enough to want to cuddle, but I truly can’t fall asleep if I’m being crushed to death. You know, one night several years ago, I had a dream I was being attacked by an alligator. I ended up punching the alligator in the face, which in reality turned out to be my husband’s crotch. When he woke up in agony, I tried to feel bad for him, but it was too damn hilarious! Good one Mate-eeee…after 32 years of tossing, tugging, and tagging (you know- that uncontrolled slap in the night when, in a dream, he’s defending my honor by fighting off some fearsome foe) the dog and I are getting even by creating a snoring stereo sandwich…not intentionally. Sleep karma, I guess. Oh….THAT slap in the night! Yep…it’s always for MY own good. Or there’s the Kick, too. Me: Ow! Why did you kick me?? Him: The alligators. I had to get them off you somehow. They were eating you alive. Me: Thank you for kicking me? LOL at the Snoring Stereo Sandwich….and your alliterative comment in general!!! I have discovered the secret to the bolster pillow – to look at it you would not think that the little cylindrical piece of foam has any point other than being a decorative adornment to the bed whenever I deign to make it. But NO it, foam ear plugs and a pillow draped over my head/ear has finally achieved what the years have not – a good nights sleep. The bolster goes down the middle of the bed any attempt [after sleep has been determined upon] to cross the divide earns snarls and ruthless leg kicks to send the limbs back to where they should be. If someone needs to cuddle something to sleep then the pillow is ‘there for them’ without complaint and I can stretch out without someone breathing in my ear all night – Ewww!!! Foam ear plugs deaden the sound [the one’s used on building sites are the best and NO I’m not actually kidding here] so that you have a chance to fall to asleep unaccompanied by nighttime rants about getting the files out of the garden shed or the monkey’s trying to get in [don’t even want to know what that dream was about]. The snoring of our house-guest which sounds like a sinus impaired pig snorting out truffles in the rain no longer plays a loud accompaniment to my husbands more nasal twang which oddly resembles the backing for a country and western song. The draped pillow just adds to the silence and also helps block out the light of day when it so rudely arrives. The ear plugs help in other ways too – I can now crank the aircon up without the nightlong rumble so I can sleep without needing a shower every hour or two in the worst parts of the Qld summer. But it is the bolster that holds my heart – space to stretch and sleep with a line I guard more zealously than those guards once posted on the Berlin Wall. The truly odd thing is – when my husband travels I find it hard to sleep without him being in the bed – I can see how this confuses him but I am female and it is my role NO my duty to confuse and befuddle the males around me before curling up to sleep in glorious silence and space my back guarded by a decorative pillow. The Bolster! Sounds like a horror movie coming to a theater near you! lol. That was a really well-written funny comment, Jenni. Also your husband seems to have very creative dreams – – might he be a writer too?? Yes he is but he also works in mental health and as such I think he had some very weird things to process over the course of a day and as such night time for him is an amusement park ride in the land of the strange. I do watch my husband while he sleeps—I want to be there at the moment he turns into a dragon. I know this is about to happen because no other animal could make such noise. We’re even, though. As he said yesterday morning, “This little woman is the biggest blanket hog.” Thanks for the hilarious post. Ha – – I get the biggest kick out of when a guy says, “This Little Woman!” You guys seem to have worked out mutual mature nocturnal madness. thanks for reading . Having said that, I have to admit that I’m the one guilty of most of the infractions. I wish I had a dollar for everytime my husband said I woke him up laughing in my sleep. And now you got me laughing with your last line. But good for you – – unconscious laughter must just come straight from your soul….nothing funny needs to occur. I envy that. Separate beds is the *only* way to sleep. Preferably double beds, in separate rooms, so he can’t grab me in a headlock- Oh, I’m sorry, HUG- just as I’m dropping off to sleep and jerk me awake again. I was sniggering at the first line of this post, and I loved the line about putting poprocks in his mouth. Have you tried it yet? I expect to hear about the results. Fine, fine! I’ll take an ugh, thanks! Yes, an ugh, and here you go: 15 years last December 12th! 15 years. Yes, I snore, but more quietly with a C-PAP. It’s Cimmy who snores loud now. But we still cuddle. I like it that way, so, there! I plan on using this line out of context to the wrong person this week just for fun. Thanks for this. Haha. Thank you – -Yeah, it’s a pretty good state of affairs when the only criticism you can find is that someone breathes. It’s kinda like I always tell my kids – – “You’re terrific children but MUST you need to be fed every SINGLE day? After 32 years of sleeping together we have it figured out. It helped when we were travelling that a hotel put TWO twin blankets on a queen bed !! Heaven! No more fighting for covers. And for those nights when the snoring is too loud, or I can’t find the remote to turn the t.v. off, there is an empty bedroom down the hall. Thanks for the laughs! Dear Someone – – Come back and give your name so I can send your prize. You seem to be in the longest relationship with the best bedroom behavior!! I forget that some couples share bedcovers. We have completely different preferences. Fortunately, he doesn’t care what the bottom sheet is, so I get to use what I want. Every night. Okay, I think we’ve found your true calling as a Practical Joker when you’re not naming people and pets. Those are some doozies! Ooops. I sometimes drink too much coffee. I don’t think it possible to outfunny you, but funny is contagious, even virulent at times. Your story was too real and so I laughed until my grand daughter closed my door so she could hear the TV two rooms over. Thank you! Oh, and I am composing a name story to post at just the right time. Hey you – – if you tend to sleep occasionally, then it applies to you. Have I ever told you how gorgeous your gravitar is? Are you a model? Re: Pop Rocks – – simply click on the words in my post and it will take you to a link of a woman who beat me to the Punch. Or Pop, as the case may be. Yep. As usual, I get a “good” idea, and google it, but it’s already been done. Well, bless her – – she probably needed the revenge before I did. Thanks for reading! Python snakes suffocated our bliss. My current bedmate likes to have the freedom to “flail”, and flail he does, so I stay out of his way as I lie on a small piece of real estate, dead to the world. sell casters for “Interior Decorator Break-ins”. Pounding the pavement to hustle up sales might help you sleep better? [I crawl under the vacant bed to avoid being clobbered by pillow missiles]. Your twins could market to twins who marry twins in Twin Cities. You are too kind. I went back to bed after I hit the Post Comment button, thinking that I needed more inspiration to do your post justice. I woke with sensory deprivation from napping alone. Will you just write my material already and call it a day?? Grace the Ghost Writer. No I will NOT write your material for you. You are too good at it. I could be a ghost and silently lurk from the shadows. Very funny! Personally, earplugs have saved my marriage! Yes, a case of “Hushers” earplugs was going to be the “Prize” I sent to anyone claiming to have Bedroom Bliss for longer than five years. Because. It. Cannot. Last. When my husband and I first got together, I was offended that he didn’t want to go to sleep every night in the spoon position. Twelve years and three pregnancies later, yeah, not so much. 1) It’s hard enough to find the position that won’t cause me to have to get up and pee multiple times a night without having to take into account another person’s comfort. 3) He didn’t snore in his twenties. Polite bedfellows finish last! (That’s re: your #1) As to the rest. . . glad we’re in the same boat. But not the same bed! Thank you for coming here! Oh my, this was so funny. Great addition with the Lucy clip. I am sure that the fact that one is sleeping while the other is not give that person lots of plotting time such as pop rocks. This would certainly be a great comedy skit or perhaps something like Friends or Seinfeld. You have such a great writing style. Fun way to address this, laugh out loud for sure. Plotting gives the insomniac something productive to do. Thanks for reading! Oh Wendy! Please just call up the NY Times and tell them their search is over. I am finally on my way and I’m sorry I kept them waiting this long. 😉 Seriously – – I would love that. Dream job. I do write a humor column for a magazine here called, “North County Woman” and that’s fun. It pays for my dog’s food. Oh well, rest assured – – I’m still coming to east coast – – didn’t I read that you accepted my application for maid/cook? I struggle to fall asleep with my husband snoring in my ear or on my face! Sometimes I feel like I’m being clobbered by love. Before I actually fall asleep, I make him roll over, so that I feel alone. However, I must admit, when I wake in the night, (which is often many times) we are almost always touching one another. The “Ear Snore” As if you might miss it – – they gotta pipe it in directly!! And I love, “Clobbered by Love.” Can you title your next post that? I second that “sleeping is a solitary activity”. I HATE, HATE spooning, or cuddling, or touching when I am trying to go to sleep. For two reasons: one, its hotter then hades, and two, I feel like I can’t get comfy because they seem comfy. Not a fan. I love to sleep along on my california king. All that room to myself = blissful night sleep. I couldn’t do twin beds…but my king and his twin bed, Im definitely good with..haha! Oh my goodness! I was getting ready to send you the prize because surely nobody is going to beat out 35 years! But then I read on and realized…..”nope, she’s not just in the dog’s house….she’s in the dog’s bed!” No prize here. Sorry that you have to play musical beds in your own home. But, happy that you’re aware of your “awesomeness!” Thanks so much for commenting – – wonderful to hear from you! This is hilarious and so true. I now have my bed to myself, oh, it is heaven. I smile when I go to bed and smile when I wake up and can roam around the whole bed to my hearts desire in between. I share those experiences! See you’re not just “Random Rose” you’re “Ramblin’ and Roamin’ Rose!” Bless you for your freedom to do so!! Ha ha ha, love that. I am those things and not just in bed. I ramble on (as you have probably read) and love roaming around places and after 42 years of constraint I cherish every mini second of freedom. Maggie Mae – – I can always count on you to come here, read my entire post and then zero in on the one line I am most proud of. And that nobody else probably even notices, let alone gets. You’re a sharp shooter! And yeah – – we never feel hot. We JUST ARE! Oh, God, Stephanie – you’re TOO funny. I’d quote the funniest bits at you, but I’d be typing the entire thing out again. Anything that contains an I Love Lucy clip is going to be a winner too. Nothing is as luxurious as having an entire bed to myself.. No one to hog the duvet, moan about me playing Simpsons Tapped Out on the Kindle, no deadweight of an arm pinning my arms, no breath on my neck. Definitely twin beds/separate rooms/living completely separately is the way forward. Deadweight of the Arm Pin. How did I forget that one? Thanks Gluestickmum! Wanna be my roommate? Not bedmate, sorry! We can watch Lucy reruns all night long! That sounds ideal to me. Twin beds, but matching pjs, naturally. Naturally. But first we’ll hang in “our lounge.” Where would that be, again? Hahahahahaha! I’m going Cray in a commercial bus! You couldn’t be more right though, Miss Pause. I find all that ‘body squeezing’ quite annoying, especially when i just want to flip on my stomach and journey to Lala land. Thanks for making my day, AGAIN. A commercial bus? Where are you going? Thanks for backing me up here – – Women need to sleep under glass cases, like Snow White. Doncha think? Missing your blog – – my stupid Reader stopped updating. I will come to you DIRECTLY to catch up. I was heading to work. Oh I agree with you alright. A fully outfitted glass case will work just fine for us. Sorry about reader issues, didn’t know that could happen. yes, it happened and now I’m having to visit everyone’s blog directly. Btw, I see you also “know” fellow blogger Lively Twist? How did that come to pass. I love the Blogging world!! Ahh the power of tags and blog hopping syndrome, Steph.